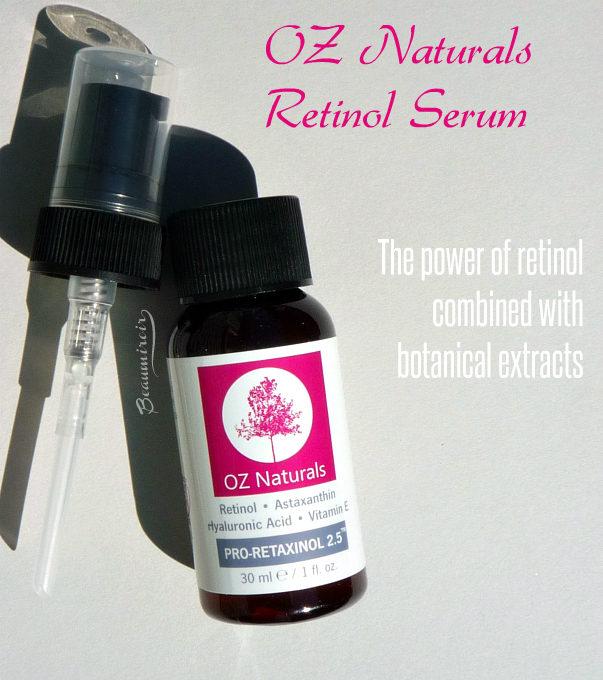 Today is all about the eyes here with a new cruelty-free eye treatment, the Matrix 6 Mega Bright Eye Gel by OZ Naturals. You may remember that I recently reviewed another eye gel by the same brand, the Super Youth Eye Gel. Water, Acrylates Copolymer, Glycerin, Caprylic/Capric Triglyceride, Caffeine, Palmitoyl Tripeptide-38, Palmitoyl Tetrapeptide-7, Palmitoyl Tripeptide-1, Malus Domestica Fruit Cell Culture Extract, Urea, Sodium Hyaluronate, Chrysin, Xanthan Gum, Maltodextrin, N-Hydroxysuccinimide, Hydroxypropyl Cyclodextrin, Steareth-20, Hydroxyethylcellulose, Citric Acid, Caprylyl Glycol, Sorbic Acid, Phenoxyethanol, Sodium Hydroxide. Matrixyl and Haloxyl are trademarks and they can be found in the ingredients list under the name of their actual components (Palmitoyl Tripeptide-38, and Palmitoyl Tetrapeptide-7 + Chrysin). - The gel is light, feels refreshing, and is absorbed very fast without leaving a greasy residue. - There's a real toning/firming effect just after application that makes the undereye area look more youthful. It's particularly efficient when I haven't had a good night sleep and look really tired. - The product is cruelty-free and made in the USA. - It's fragrance-free and feels very gentle to the fragile skin under my eyes. - The opaque white packaging with a pump is convenient, and it protects the anti-aging ingredients against sunlight and air that would degrade them. - Quite affordable, it's usually on sale around $20. - Despite the presence of hyaluronic acid in the formula, I didn't find it very moisturizing. 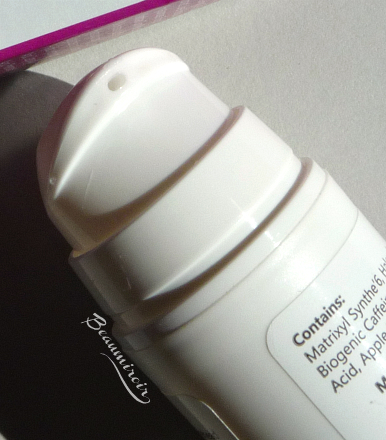 It's definitely not nourishing enough for dry skin, and I like it best as a serum under another classic eye cream. - It can leave my skin a bit sticky if I use too much. - For me it really doesn't work under makeup: whatever concealer I try to use on top, it looks streaky and balls up. That's another reason why I prefer to use it as a first step under an eye cream that works well as a base for makeup. - I can't say that I've seen a visible improvement in my dark circles. But did I mention they were severe? Maybe it would have an effect after several months of use, but after about 3 weeks, they look pretty much the same. 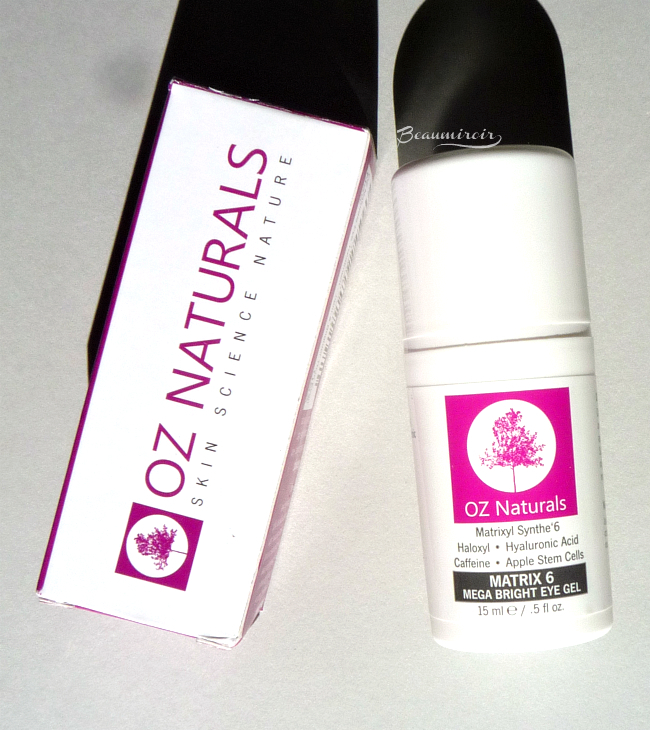 OZ Naturals Matrix 6 Mega Bright Eye Gel is an affordable anti-aging option for the eye area with interesting ingredients. I appreciate the firming effect but I need to use something else on top to get enough moisture and prep the skin for makeup. Where to buy? On Amazon. The product featured in this review was provided by the brand's PR for consideration. I received no compensation other than a free sample to write this post, which only reflects my personal opinion. This post contains affiliate links.